The New England Patriots overcame the 'deflate-gate' row to beat the Seattle Seahawks 28-24 in the Super Bowl. The Patriots are being investigated over allegations they under-inflated balls in beating the Indianapolis Colts to reach the showpiece event. But, despite trailing 24-14, they rallied to become the first team in Super Bowl history to trail by double digits in the second half and win. The Patriots took the lead with two minutes left and held on for victory. Butler on his interception: "I just had a vision that I was going to make a big play and it came true"
The New England Patriots quarterback Tom Brady was named the most valuable player of Sunday's Super Bowl, with the 37-year-old throwing four touchdown passes, including two in the fourth quarter. He set a new record for career Super Bowl touchdown passes with 13 to break the old mark held by his childhood idol Joe Montana. Brady's 37 completions also set a new Super Bowl record. Pop star Katy Perry was the star attraction at the interval and she was joined by special guests Lenny Kravitz and Missy Elliott. Perry entered the pitch on a giant golden robotic lion as she sang her hit 'Roar' before Kravitz provided some rock and Missy Elliott some hip-hop. The climax saw Perry lifted 50 feet off the ground by a mechanical contraption and she sang 'Firework' as she floated above the pitch. Seattle Seahawks head coach Pete Carroll was criticised for his decision to throw, rather than run the ball with powerhouse Marshawn Lynch, with his team a yard out and just seconds remaining. "That play call will haunt Pete for the rest of his career," said former Cowboys receiver Terrell Owens. "Why get cute at that point?" ex-Green Bay Packers player Bucky Brooks commented. However, Katy Perry received some praise. Pop star Britney Spears said: "That half-time show! Katy Perry you rocked it." 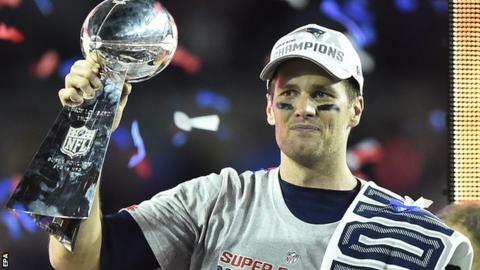 The New England Patriots players will receive $97,000 (£64,000) per player in prize money, while the Seattle Seahawks players get $49,000 (£33,000) each. More than 110 million people were expected to have watched the Super Bowl as it was broadcast live in more than 25 different languages. Advertisers were charged an estimated $4.5m (£3m) for 30-second spots in this year's Super Bowl. The day of the Super Bowl is the second largest day for consumption of food and drink for Americans, behind Thanksgiving Day. The Pittsburgh Steelers hold the record for most Super Bowl titles, with six. The San Francisco 49ers and Dallas Cowboys have five each.